You might be surprised to find radio popstar darling KT Tunstall on a blog devoted to exploring the boundaries and possibilities of folk. Thanks to our shufflesong culture, many people never truly explore the work of artists like Tunstall beyond chart-toppers like Hold On and Suddenly I See, to name but two beat-heavy guilty pleasures of mine which have infiltrated every inch of our sonic culture. But I’ve long had this Grammy nominee’s sweet, simple Under The Weather, with its thick, mellow guitarstrum and longing, trapped in the part of my skull I use for folkmusic. In fact, if you go back to her albums, I think you’ll find that a vast majority of KT Tunstall’s work is comparable to the singer-songwriter fare of a post-production Kathleen Edwards, Paula Cole, or Aimee Mann. Trying to reconcile the sweeter, folkier sounds of her less-heard album cuts with the funky modern edge of her more memorable singles led me to KT Tunstall’s Wikipedia entry, which — sure enough — reinforced my suspicions by claiming her legitimacy as a folk musician. 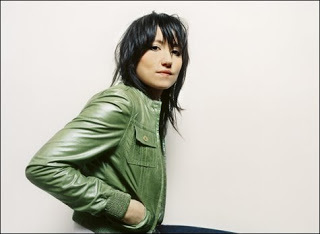 Which brings us here, today, to explore the folkier side of KT Tunstall. I am constantly confused by the relationship between pop and folk music; apparently, so is my local library, which files such staple folk musicians as Shawn Colvin and Dar Williams in the Pop section. But such placement is not arbitrary — near as I can tell, it’s the production of these albums which matters to them. And sure enough, the recorded output of Williams, Colvin, and a whole generation of modern singer-songwriters is produced as if for pop radioplay. There’s a whole range of artists who genuinely do fall into this folkpop camp, and many of them, like Joan Osborne and Ani DiFranco, identified as folk artists first. But while I think self-definition matters, we here at Cover Lay Down think genre identification is in the sound as much as the sensibility. If this is folk — and I think it is — then we’d be remiss in not calling attention to the best of it when it passes by. 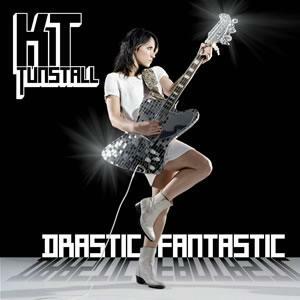 Luckily, it is no stretch to give KT Tunstall the folk treatment. Though her Top 40 work is produced with an eye towards a particularly modern, stomp-and-clap britpop sound, her background, her preference for acoustic guitarplay and balladry, and her live performance belie a sense of song as fundamentally happening between herself, her strings, and her audience. KT Tunstall has a singer-songwriter soul inside her popstar performer mentality, and I like that: it means tasty beats in hit-single production, but plenty of intimate folky cuts between the singles, and lots of stripped-down selections in her live performances. The glee with which she reconstructs Missy Elliot’s Get Your Freak On – as seen in the video clip below – is ample evidence: though her penchant towards coversong choices is more rock and roll than anything else, with or without her everpresent foot pedal, Tunstall plays like a folkin’ busker. Even in her more upbeat moments. And that ain’t bad. Tunstall’s had a big week in the popworld: a newly-released UK single, and a stunning new video for If Only, can only cement her reputation as one of this generation’s bright shining popstars. But if your folkbrain has already forgotten the softer folkpop of her first album, skipped past the moodier cuts on Drastic Fantastic, or missed entirely her sophomore fan release Acoustic Extravaganza, these deep tracks and live cuts that have been making the blogrounds may help you, too, reconsider KT Tunstall’s cred as the modern queen of Scottish folk. The first two cuts are b-sides on her new UK single for If Only, so I’m streaming them in the hopes that my UK readers will pick it up; the rest are already out there, so enjoy.